The key reason I chose this machine is that the separate Ultrabase makes the unit very versatile. The CPU by itself is very light, but has no spindles. There is a custom floppy port for an external drive (which I have added) and there is a space for either a floppy or second battery in the Ultrabase. There is another bay in the base which can hold a CDROM or a DVD or a CDRW/DVD combo. Mine came with a CDROM and I've bought a DVD. Since the PII runs at 366 Mhtz, it should be able to play DVD's OK. The video is basically the same as the 390, but the audio works much more cleanly on the CS46XX. XOrg and ALSA work out-of-the-box, and MPlayer and other goodies from the debian-multimedia.org site seem to confirm the little devil's chops as a multimedia system. APIC seems to work as designed on this system. The initial initrd boot image seems to load very slowly (much more slowly than on the 390, for example) but after that, everything behaves as expected. The only other quirk is that the dreaded Windows ME seems to fail every time on first boot, maybe because I'm not hibernating? 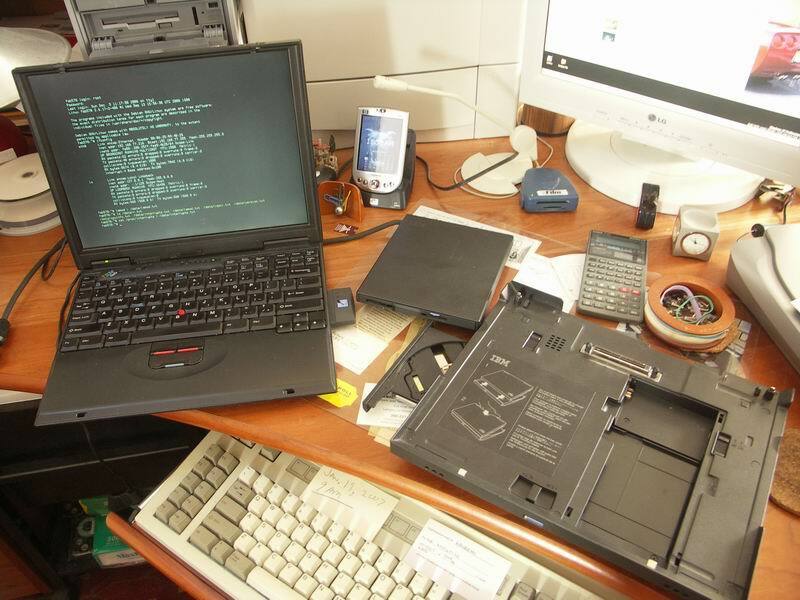 On the other hand the first linux boot after Windows isn't always clean, either: Sometimes the ALSA seems to step on the PCMCIA and the WPC11 won't come active. The biggest physical liability is that the screen bezel is cracked a bit at one corner and the hinge connection is a little flaky, so you have to play with the screen hinge a bit to find a stable position where you don't get various psychedelic manifestations flashing on the screen. All in all, however, the light weight (without the base), full VGA screen and borderline-but-sufficient CPU make this much more useful 'spare' than the 390 is/was. Not bad for $81 on eBay.